In Greek mythology, Lycomedes was named as the King of Scyros, and yet little more is known of Lycomedes, despite the fact that this king appears in the storyline of both Theseus and Achilles. Scyros is an island of the Sporades group, located in the Aegean, to the east of the island of Euboea; with Scyros so named because of its ruggedness. 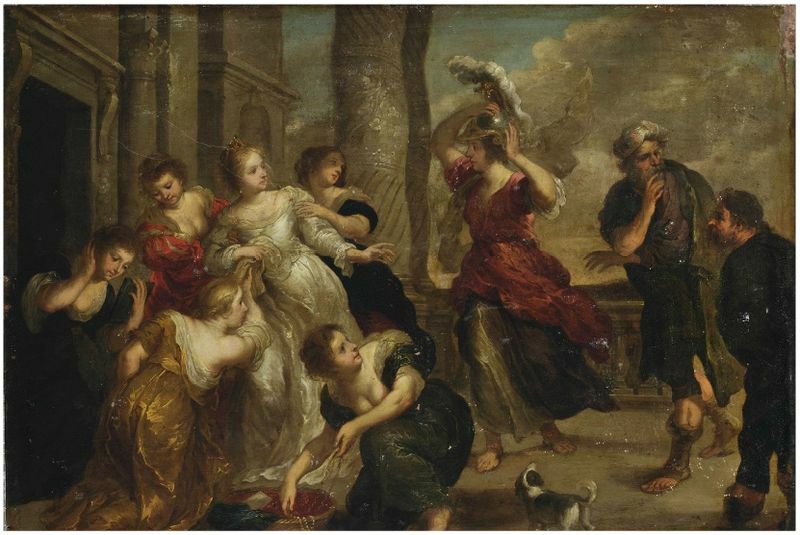 In the age of heroes of Greek mythology, Scyros was ruled by King Lycomedes, but in the surviving ancient sources, no lineage is given for Lycomedes, nor was it said who is wife was, although the wife of Lycomedes gave birth to seven daughters for the king. The people of Scyros ruled by King Lycomedes were called Dolopians, for the island had once been colonised by people from Dolopia, and had kept their tribal name. Lycomedes was certainly on the throne when the Greek hero Theseus came to Scyros. Theseus had been deposed from the throne of Athens by a Spartan force led by Castor and Pollox; the Dioscuri rescuing their sister Helen, who had been abducted by Theseus. Theseus was absent at the time, a prisoner in the Underworld, but when he returned he could not unseat Menestheus from the throne. Theseus would thus depart from Athens, and leaving his children upon Euboea, would sail onwards to Scyros, where Theseus still had some estates, left to him by Aegeus, Theseus’ father. Lycomedes was said to have welcomed Theseus to Scyros, but it was also said that Theseus lost his life whilst a guest of the king. The most common version of the Theseus myth states that Lycomedes pushed Theseus from one of the island’s cliff, King Lycomedes being worried that Theseus would overthrow him. Alternatively, some tell of Theseus just slipping, and then falling to his death. A generation later Lycomedes would once again appear in the timeline of Greek mythology, this time Lycomedes would play host to Achilles. It was probably that Lycomedes was unaware of who his guest was though. Thetis, the Nereid nymph mother of Achilles by Peleus, sought to hide her son away from danger, for a prophecy had been made of a short and heroic death for her son, and so Thetis tried to prevent Achilles from fighting at Troy. To this end, Achilles was dressed up as a girl, and Lycomedes was convinced by Thetis that the “girl” she brought to Scyros was actually Achilles sister. Achilles would thus live and play alongside the seven daughters of Lycomedes. One daughter of Lycomedes, Deidamia, would see through the disguise of Achilles, and the pair would become lovers, and indeed would secretly be wed. Deidamia would subsequently give birth to a grandson for Lycomedes, for Deidamia was the mother of Neoptolemus. Achilles would eventually leave the court of Lycomedes when Odysseus and Diomedes came to Scyros in search of the son of Peleus; and Achilles was tricked into revealing his manhood, when the disguised Achilles chose armour as a gift, instead of feminine baubles, and picked up his weapons when he believed that Scyros was under attack. Neoptolemus would remain in the court of Lycomedes though, but eventually he too was called upon by Odysseus to fight at Troy. Alternatively, perhaps Lycomedes was not a host of Achilles but a victim, for some believe it wrong to think of a great hero hidden away disguised as a girl. Thus these sources tell of how whilst still a youth, Scyros was conquered by Achilles, and Lycomedes put to the sword, for Peleus had dispatched his son to gain revenge for the death of Theseus. Thus, it was on the island, shortly after its conquest that Odysseus and Diomedes found Achilles, and convinced him to join them and the other Achaean heroes at Aulis.